"Renaissance Impressions: Chiaroscuro Woodcuts from the Collections of Georg Baselitz and the Albertina, Vienna"
"Germany Divided: Georg Baselitz and his Generation. From the Duerckheim Collection"
More than 130 prints documented the development, refinement and spread of this technique in France, Italy and Northern Europe. The story told was, as so often with early printmaking, one of innovation and experimentation. The chiaroscuro woodcut is thought to have been invented in Germany before spreading to Italy and the Netherlands, where it underwent further developments particular to each school. On its appearance in the opening decade of the 16th century, it caused a sensation and was one of just a handful of printmaking techniques to be mentioned in Vasari’s Vite.3 Here, finally, was a sophisticated color image that could be mechanically reproduced in multiple copies, yet was capable of evoking the tonal subtleties and highlights of wash drawings. 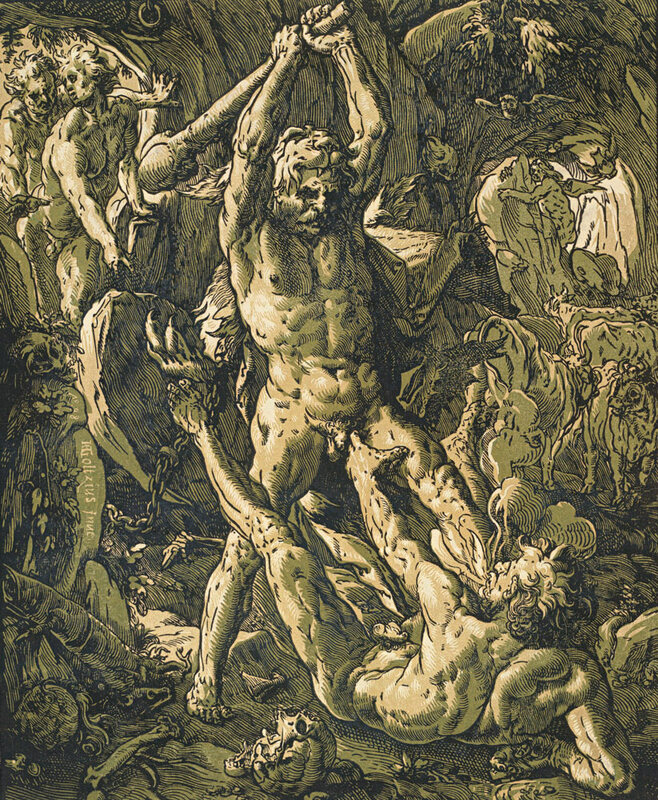 Hendrick Goltzius, Hercules Killing Cacus (1588), chiaroscuro woodcut printed from three blocks, the tone blocks in yellow and green, 41.1 x 33.3 cm. Collection Georg Baselitz. Image courtesy of the Albertina, Vienna. The technology hinged on the use of multiple blocks: a key block provided the contours of the composition while additional blocks were used to superimpose layers of color, often different tones of the same shade, creating a harmonious result. Some prints dispensed with the key block altogether, relying solely on layered colors to bring the composition into focus. This was a marked departure from earlier woodcuts in which color was applied by hand, block or stencil, without overprinting, resulting in large, crude areas of color that lay awkwardly side-by-side. The execution of chiaroscuro woodcuts demanded meticulous precision in the carving and registration of the blocks. These difficulties, and the consequently brief period of production enjoyed by the technique, account for the works’ relative scarcity today.4 The ends, however, justified the means: the prints on view at the RA’s exhibition were all grace and elegance—watery impressions in a subtle, crepuscular palette, encompassing marble-like grisaille and dappled greens and blues. Ugo da Carpi was the first Italian artist to adopt the chiaroscuro woodcut. His Diogenes (c. 1527), after Parmigianino, was printed from four blocks in transparent blues and greens, giving the philosopher a faded, dreamlike grandeur. Group of Men and Women (c. 1545–47) by da Carpi’s compatriot, Domenico Beccafumi, was printed in two shades of blue, lending the languorous duo in the foreground the appearance of mermen resting far below the waves in the shadows of the sea bed. Many of the Italian prints, like da Carpi’s Diogenes, were reproductive, whereas German and Dutch artists created original compositions using a markedly different visual idiom. Goltzius exploited the technique’s most graphic and dynamic qualities. His Landscape with Trees and a Shepherd Couple (c. 1600) hums with small details of bucolic activity. 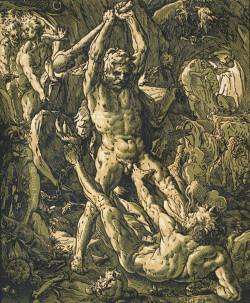 Hercules Killing Cacus (1588) shows the mythological hero as a hollow-eyed and terrible figure preparing to deliver the fatal blow to the giant; the chiaroscuro technique heightens the violence and casts sinister pools of shadow on the bone-strewn lair. By contrast, a similar moment in which an opponent is felled, Giovanni Pollo’s Cain and Abel (after Marco Pino, c. 1570–80) becomes in Italian hands a scene of cool restraint and quiet beauty. Owing less to line and hatching than to light and shadow, chiaroscuro woodcuts are something of a print paradox. The effect is all the more striking when they are brought together in quantity. Given such visual appeal, it is not surprising that so many famous printmakers chose to toy with this spectacular technique. The prints on view at the RA came from two collections, each put together in response to the chiaroscuro woodcut’s siren call: that of Duke Albert of Saxe-Teschen (1738–1822), whose holdings now reside in the Albertina, and of the contemporary German artist and honorary Royal Academician, Georg Baselitz, who loaned over three-quarters of the exhibition’s contents. Georg Baselitz, Hirte (Herdsman) (1966), etching, drypoint and aquatint on zinc plate, printed on wove paper, image 31.9 x 23.5 cm, sheet 43.2 x 32.3 cm. Presented to the British Museum by Count Christian Duerckheim. Reproduced by permission of the artist. © Georg Baselitz. Concurrent with “Renaissance Impressions,” the British Museum’s “Germany Divided: Georg Baselitz and His Generation” offered the opportunity to see the use made of these 16th century works by an artist of a dramatically different time. The British Museum display also grew from the passion of a collector: Count Christian Duerckheim, who has formed an important collection of postwar German art (and has given several works to the BM’s department of prints and drawings). In addition to Baselitz, the exhibition included five other German artists who came to prominence in the 1960s and ’70s: Markus Lüpertz, Blinky Palermo, A. R. Penck, Sigmar Polke and Gerhard Richter. All began life in eastern (soon to be East) Germany but, with the exception of Penck, forged their careers largely in the West. Their mixed-media drawings, watercolors, prints and photographs show powerful responses to the legacy of World War II: guilt, anger, humiliation and despair are mixed with anguish stemming from Germany’s partition. Though the trauma may have been collective, the responses are individual—few stylistic devices unite these artists. Richter is arguably the best-known of the group, and one wonders whether his dual training, East and West, accounts for his ambiguous approach to these difficult themes. The abstraction of his photographs, sketches and watercolors on tracing paper, such as Untitled (2.1.1978), is far more cryptic than the patently dystopian figuration of Lüpertz, Penck and Baselitz. The latter’s satirical treatment of the eagle, with its associations of Prussian militarism and the Third Reich, invokes and mocks the German past, while Polke used the visual language of Pop Art to critique the consumerist excesses of the West German present. His gouache abstractions and austere lithographs are, like Richter’s work, more open to interpretation, with many being visual records of earlier installations or paintings. The tenor of the exhibition, however, was set by Baselitz, whose works occupy roughly half the exhibition. Scenes of grotesque distortions, barren wastelands and lone figures convey a mood of “defiant nihilism,” as the exhibition text puts it. 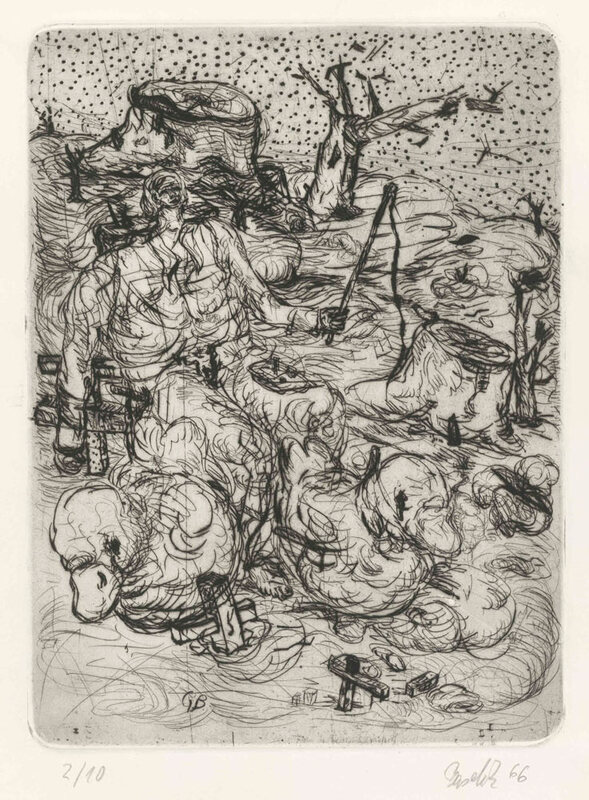 Herdsman (1966), a frenzied etching with spiky drypoint additions, subverts the pastoral ideal of its title. Apocalyptic scenes populated by unsettling objects and figures recall Dali prints of the 1930s, such as Enfant Sauterelle (1933), in their scratchy technique and grisly visions. 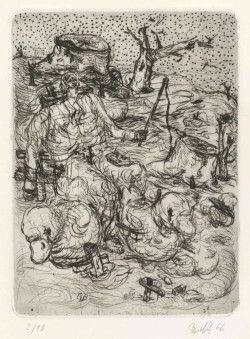 The dishevelled antihero pictured in Der neue Typ (1965) is the defining figure of these landscapes and an enduring one—the artist recently reworked the composition as part of his 2006 etching series, Remix (Etchings), published by the Paragon Press. “Few artists,” Florian Simm has observed of Baselitz, “have, over the span of their career, so persistently wrestled with the possibilities of printmaking in its many forms.”7 The artist’s woodcuts in particular can be seen as a conscious championing of a great graphic tradition, as can his actions as a collector and his decision to share the very prints that inspired this passion in the RA’s beautiful show.